What is the role of Security Intelligence & Analytics? When it comes to cybersecurity threats, no one is immune. In fact, the entire conversation has shifted from focusing on “if you’re attacked” to “how quickly you can respond.” That’s not likely to change in the foreseeable future. The traditional security defence strategy to layer on point-product tool over another needs rethinking. 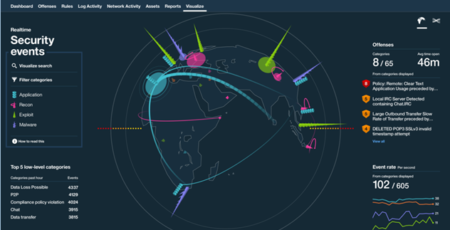 Your organisation is challenged to interpret billions of events each day to uncover attacks. Too many events & false alarms, too many systems to track threats from root cause to damage. Security teams need to see the end-to-end chain of events involved in a threat, to automatically connect related incidents and augment investigations with scalable security incident & event management (SIEM) coupled with powerful artificial intelligence (AI). Why GA Systems Leverages IBM's QRadar for its Managed Service. The endorsement by Gartner including QRadar as a leader in its SIEM Magic Quadrant provides the surety of global analyst validation of QRadar’s capability. GA Systems chooses to partner with the leading Magic Quadrant vendors to support the robust security immune system that is delivered to GA Systems customers. Advanced AI and Machine Learning make it easier and faster to find the root cause and chain of events comprising advanced persistent threats and insidious insider activity. User Behaviour Analytics (UBA), adds user context to network, log, vulnerability and threat data to more quickly, to accurately detect malicious insiders and determine if a user’s credentials have been compromised. Vulnerability Manager adds context to prioritise remediation activities. Correlating vulnerability data to intelligently manage risk, whilst leveraging the investment in existing 3rd party scanners. GA Systems leverages QRadar to find threats faster, dramatically accelerate investigation times, automate compliance, and respond to incidents.